You’ve seen it thousands of times on Facebook and other social media outlets, there is even a song on the radio about it! 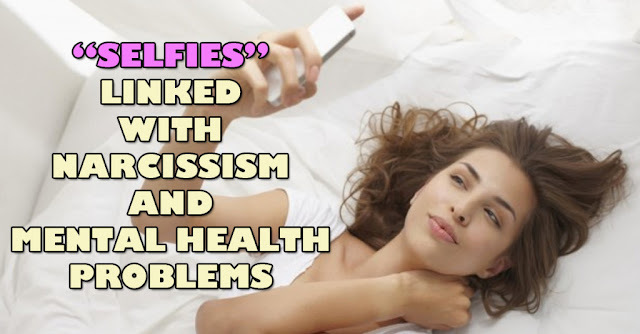 Selfies have become a huge trend in social media and psychiatrists and mental health workers are linking them to mental health conditions related to narcissism and a person’s obsession with their looks. “Cognitive behavioural therapy is used to help a patient to recognize the reasons for his or her compulsive behaviour and then to learn how to moderate it,” he told the Sunday Mirror. I’ve personally seen this with some of my own friends. They might take several selfies over and over again until they find the right one. Picking out details about their eyebrows, skin, noses, smiles, teeth, hair and so forth, all in an attempt to find the perfect angle to make the perfect picture. Even looking at how most of us choose our profile pictures on Facebook and other social media sites is a huge process. Believe it or not, as harmless as these acts all seem, they build up over time to create and create great forms of self consciousness and false sense of confidence. Instead of being okay with who we are no matter what, we strive to find the right picture with all the perfect details. The more likes we get on social media sites the happier we feel. Is this sustainable? Basing our happiness on our profile picture or selfie picture performance? How far can the selfie obsession go? A British male teenager went to the extent of trying to commit suicide after he was unable to take what he felt was the perfect selfie. Danny Bowman became so obsessed with capturing the perfect shot that he would spend roughly 10 hours per day taking up to 200 selfies trying to get the perfect shot. As things got more and more intense for Danny, he lost nearly 30 pounds, dropped out of school and did not leave the house for six months as he kept trying for the perfect picture. During his suicide attempt, Bowman was saved by his mother. “I was constantly in search of taking the perfect selfie and when I realized I couldn’t, I wanted to die. I lost my friends, my education, my health and almost my life,” he told The Mirror. While this is an extreme case, it isn’t too far off from what goes through many of the minds of young, and even older, people as they take pictures of themselves for social media. Seeing other peoples pictures, seeing the attention they may or may not get, we end up comparing ourselves and the fine details of our looks. Overtime, an obsession builds and our looks become increasingly more important to us. Something I feel we should be focusing less and less on versus more and more. “Selfies frequently trigger perceptions of self-indulgence or attention-seeking social dependence that raises the damned-if-you-do and damned-if-you-don’t spectre of either narcissism or very low self-esteem,” said Pamela Rutledge in Psychology Today. Narcissism, being obsessed with receiving recognition and gratification from ones looks, vanity and in an egotistical manner, is becoming a big problem in our digital age. I personally feel a big part of this stems from judgement of self, judgement of others and pop culture. There is a huge lack of addressing these personal issues within the education system or other programs youth and other young people have access to. We focus so much on educating a person to become a trained member of society, but we do nothing for their own personal development as a person. This is a very important aspect of personal development that I feel should be at the forefront of our education system. The addiction to selfies has also alarmed health professionals in Thailand. “To pay close attention to published photos, controlling who sees or who likes or comments them, hoping to reach the greatest number of likes is a symptom that ‘selfies’ are causing problems,” said Panpimol Wipulakorn, of the Thai Mental Health Department. The doctor believed that behaviours could generate more mental issues in the future, especially those related to lack of confidence. The next time you go to post an image of yourself online, or even when you go out for the day, observe yourself and find out how much of your thoughts are based on how you look, what you think others will think of you and how you might be using your looks to try and make you feel good for a short period of time. From there you can work on accepting every aspect of who you are as being perfect and as it needs to be without needing to look outside yourself for self-love. You are much more than your looks.